located somewhere other than at the host track. As noted in the first two legs of our feature series on handle, we are currently seeing another seismic shift in the way people bet on horses, with more and more wagering taking place via advance deposit accounts. Personally, I participate in all three platforms: wagering at the track, at my local simulcast outlet, and through an online wagering account. But let’s face facts here—technology has changed the way the world does business. Commerce is just a mouse click away. Not only is this having a sizable effect on the bottom lines of racetracks and Thoroughbred owners, it’s also having a major impact on the Thoroughbred breeding industry and where future generations of our racehorses will be born. Despite expansion in ADW handle, the revenue from casino gaming is doing the most to grow purses. It’s this “supplement” money that is causing the biggest shift in the Thoroughbred population. The news out of California that Marty and Pam Wygod are selling their River Edge Farm and dispersing their Cal-bred stock is discouraging. Farm manager Russell Drake’s comment that “opportunities for the Wygods’ breeding operation are far greater in Kentucky” comes at a time when many have already bailed on the Cal-bred program. One look at The Jockey Club’s Fact Book for 2010 and last fall’s Report of Mares Bred shows the Wygods weren’t the first to either move on or get out of the business altogether in the Golden State. While last fall’s Report of Mares Bred reported a drop of 13.5% of Thoroughbred mares bred in 2009 compared to 2008, several states—not surprisingly states without slot-enhanced purses—saw much steeper declines. In 1998, 3,229 foals were produced in California, or 9.8% of the North America population. The 2008 foal crop in the Golden State represented 9.0% of the foal crop. While that may not seem like a great drop, it’s the tip of a trend. The number of mares bred in California in 2009 compared to that 2007 group (foals of 2008) fell 37.4%, from 4,703 to 2,946. In addition, the number of stallions in California fell from 321 to 201—that’s also a decline of 37.4%. 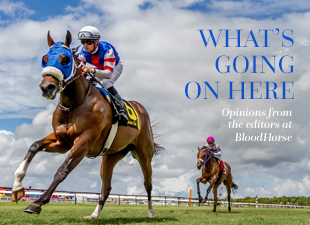 Florida, the second-leading state in producing Thoroughbreds—behind Kentucky and ahead of California—has experienced a similar fate. From 2007 to 2009, the number of stallions has fallen from 252 to 155 (a drop of 38.5%) and the number of mares bred has slid from 6,382 to 4,041 (down 36.7%). Maryland’s foal crop has fallen more than 50%. It’s little wonder Louisiana’s foal crop has grown more than 100% from 1998 to 2008, according to the Fact Book. Slots revenue has enhanced the state-bred program that is now pulling in mares from Florida, Kentucky, and Texas. In 2009 more mares were bred in Louisiana than in California. Pennsylvania’s program grew more than 50% from 1998-2008, and the percentage of mares bred from 2007 to 2009 rose 36.7%. New Mexico-breds represented 1.3% of the Thoroughbred population in 1998; in 2008, they made up 3.3% of the breed while racing for much bigger pots from Ruidoso to Sunland Park. Breeders in Texas face a triple whammy as they are surrounded by states—Louisiana, Oklahoma, and New Mexico—with gaming revenue as part of their racing programs. This shift is creating a whole new set of haves—states such as Louisiana and Pennsylvania—and have-nots—historically significant states such as Texas and California. While the growth in purses from casinos is welcome for haves and have-nots alike, don’t think for a second that it’s best for racing in the long run. For racing to prosper, we need to take this opportunity that the casino revenue affords us and figure out a way to have real growth through ADW.